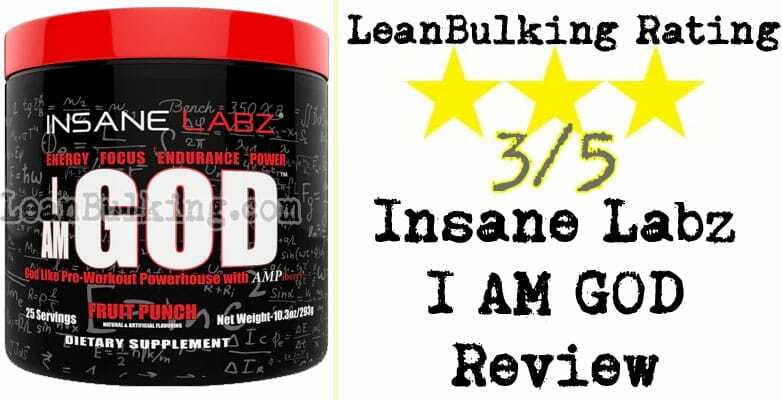 Insane Labz I AM GOD Review | Expert Pre-Workout Analysis | Worth It? 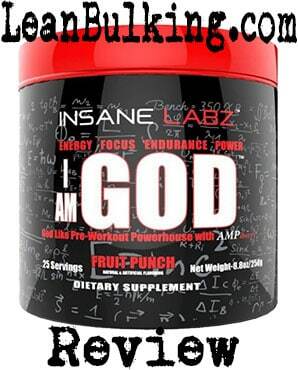 I AM GOD is a pre-workout supplement made by Insane Labz. It comes in 25 serving containers for $59.95 and comes in 3 flavors - Fruit Punch, Apple, and Drink Ye All Of It. This is one of the most expensive products we've reviewed, and most of our favorite pre-workouts are cheaper - so we're expecting nothing but the best with Insane Labz' pre-workout released in 2017. 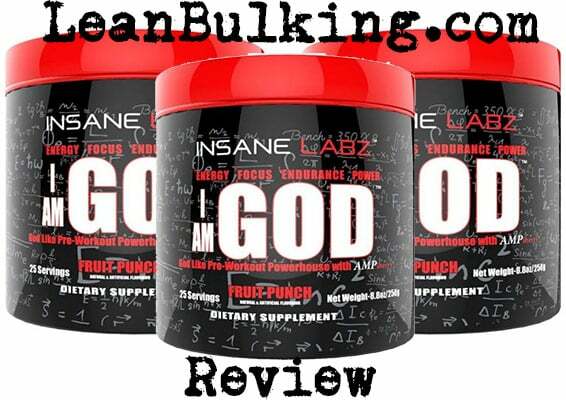 Insane Labz aims to create strong products, with their supplements all being named in a similar manner to I AM GOD. 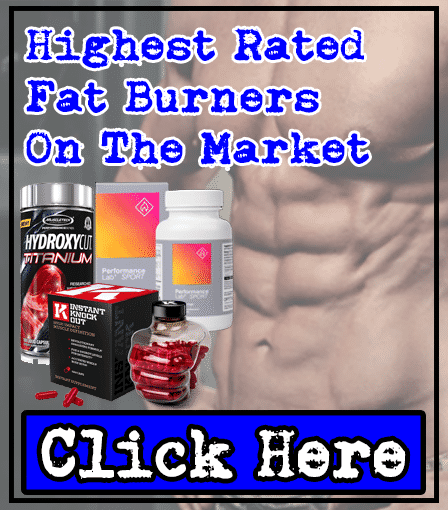 They're based in the USA and market a range of supplements - from testosterone boosters to this pre-workout. However, there wasn't much more information available on their website. Let's see whether the ingredient list for I AM GOD proves that it's worth trying - or avoiding. As we've mentioned, Insane Labz have put a big price-tag on I AM GOD pre-workout, so we're expecting big things; this is easy to see from a products ingredient list. But first, we have to point out that this product contains a proprietary blend (which can increase your risk of side effects). We'll explain what proprietary blends are below here. Proprietary blends are mixtures of numerous ingredients that are only shown to you as 1 quantity. As you can see from the 'I AM GOD Blend' on the ingredient list below, the overall amount is 9.3g (9,300mg) - but you're not shown the dosages of each ingredient inside such as Caffeine. 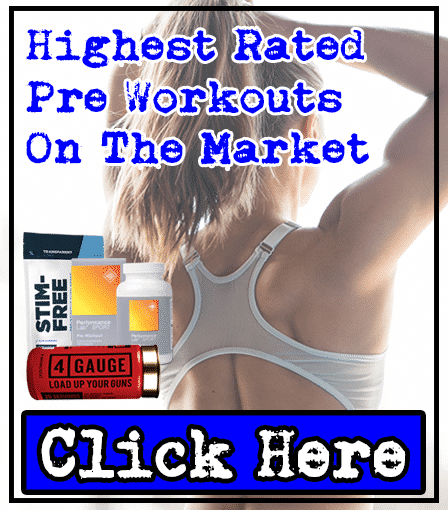 This increases your risk of side effects such as jitters, and also makes it uncertain whether this pre-workout will work. For this reason, we try to avoid any supplement that contains proprietary blends. Now you know what proprietary blends are, and why there are no benefits to having them in supplements; we'll analyze each ingredient inside I AM GOD below - so you can see how effective this pre-workout really is. One of the best pre-workout ingredients available; Creatine's proven to boost your strength and endurance in the gym. In fact, it was used by Olympic athletes in the 1990's, proving how effective it really is. Since then, it's become one of the most reliable ingredients in the supplements industry. However, you need at least 1g per serving for it to work. As Creatine Monohydrate is part of a proprietary blend, there might only be a minimal amount inside - meaning it would be ineffective in Insane Labz I AM GOD. We have mixed opinions on Beta-Alanine here. Basically, it's shown to improve muscular endurance - but it causes a side effect called paresthesia. Simply put, paresthesia is a tingling and itchy sensation on your face and body. Personally, we don't like this side effect and it makes it harder for us to focus on our gym session. For this reason, we try to avoid pre-workouts containing Beta-Alanine. If you want the same benefit without the side effect, then Creatine Monohydrate improves your muscular endurance in the gym (as well as your strength levels). While Taurine's shown to reduce cramping, it doesn't offer any other benefit to improve your workout. 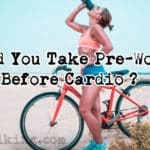 You can experience the same benefit by keeping yourself properly hydrated (which you should be doing anyway) - but there are no negatives to having Taurine in a pre-workout either. The problem is, many people mistakenly believe it boosts energy levels as it's in energy drinks like red bull. But no study has proven that it does. When it comes to Caffeine, I AM GOD contains 2 different types - Caffeine Citrate and Caffeine Anhydrous (the second is the usual Caffeine seen in supplements). The problem is, there's no need for 2 forms of Caffeine to be in 1 product (this only increases your risk of suffering from side effects). Not only that, as they're both in a proprietary blend, it increases the risk of suffering side effects such as jitters and energy crashes (basically, as no-one knows the exact dosages of Caffeine in I AM GOD, there might be HUGE dosage leading to these side effects without you knowing). With a name like I AM GOD, we're assuming that this contains a lot of Caffeine to make you think it's more 'powerful'. We recommend that you consume Caffeine dosages under 200mg in a pre-workout - to avoid any risks of side effects. 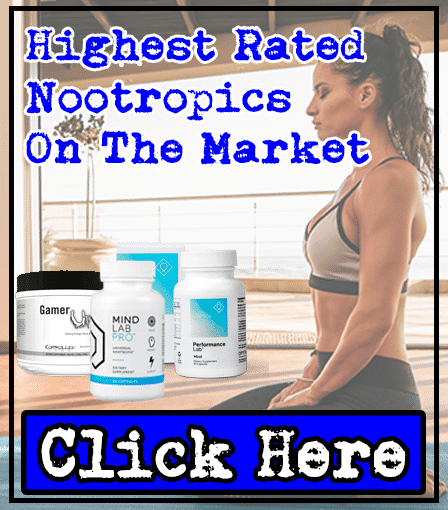 The worst ingredient in any supplement, as it's not shown to deliver any benefits - but it's been reported to cause fishy odors in your breath and sweat. To put this into perspective; Betaine is a useless ingredient that causes a side effect...for this reason, it's one of the worst ingredients you can find in any supplement. Personally, we don't want to smell fishy in the gym - so we try to stay away from pre-workouts containing this ingredient. Actually, DMAE is the worst ingredient in I AM GOD (Betaine is off the hook...). This is because DMAE's been reported to be teratogenic (meaning it causes birth defects in unborn babies). As a result, this is an ingredient that should be avoided at all costs - DMAE isn't even a key ingredient, so ingredients such as Citrulline Malate would've been better here. This is a short tree that grows in Europe, North America, and Asia. Basically, it's believed to have a positive impact on your blood pressure - but this isn't really a reason why you'd buy a pre-workout supplement. For this reason, we consider Juniper Berry to be a useless ingredient in I AM GOD. Another ineffective ingredient that can cause numerous side effects. In fact, Rauwolfia's been banned in the UK (among other countries) after causing harmful side effects frequently. We never recommend that you consume ingredients that can cause side effects - so this is an ingredient we try to avoid. There are more than 1 concerns about I AM GOD. There's simply no need to hide ingredients in proprietary blends, but this is exactly what Insane Labz have done - the sooner companies stop using proprietary blends, the better. Why? Because these blends cut costs for companies, while they're still able to keep their prices high (as no-one knows whether the ingredients inside have been dosed optimally or not). We prefer to see exactly what we're paying for and what we're putting into our body - so if you want the best value for your money, avoid supplements containing these blends. Anyway, the main problems with I AM GOD are the DMAE, Rauwolscine and potentially HUGE dosage of Caffeine. But remember that Betaine can also cause a side effect, which we'll expand on below. As we've mentioned, it's never a good sign when a company puts every ingredient inside their supplement into proprietary blends - this saves them money while they charge you the same price, and also increases your risk of side effects without you knowing. 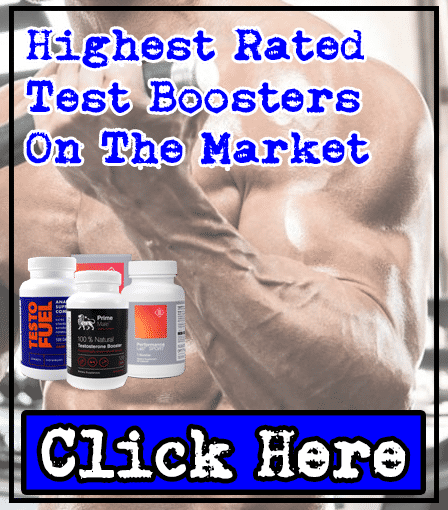 Not only that, Insane Labz have made things worse by adding numerous ingredients that can cause side effects (such as rauwolfia, DMAE, and Beta-Alanine). 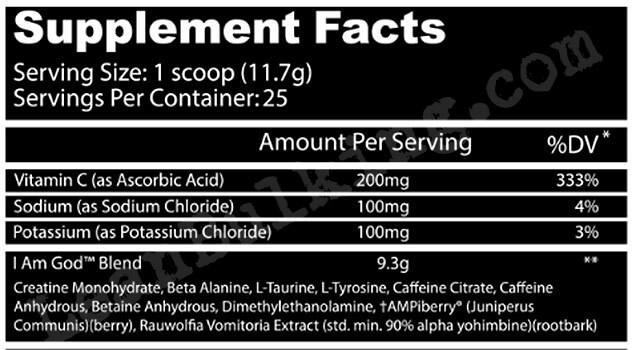 We hate to criticize Caffeine, as it's one of our favorite ingredients in both fat burners and pre-workouts, but dosages above 200mg per serving in a pre-workout can cause jitters - Insane Labz should've played this one safe and provided the exact dosage of Caffeine inside (the fact that they haven't shown us that they've put an overload of Caffeine in here and hidden the fact I AM GOD could be potentially harmful by putting everything in a proprietary blend). 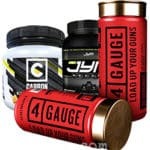 There are many pre-workouts that don’t contain any proprietary blends or ingredients that can cause side effects – we recommend looking at those to get the most bang for your buck.